The Mexican-American War lasted from 1846 until 1848. It grew out of unresolved border disputes between the Republic of Texas and Mexico after the independence of the former during the Texas Revolution of 1836. Texas was admited into the United States on 1845 and as a consequence tension with Mexico increased over the disputed border. The Mexican War (1846-1848) was the U.S. Army's first experience waging extended conflict in foreign land. This brief war is oftentimes overlooked by casual students of history as it occurred so close to the American Civil War and is overshadowed by the latter's sheer size and scope. Yet, the Mexican War was instrumental in shaping the geographical boundaries of the United States. At the conclusion of this conflict, the U.S. had added some a million square miles of territory, including what today are the states of Texas, Arizona, New Mexico, and California, as well as portions of Colorado, Wyoming, Utah, and Nevada. This fresh acquired land also became a battleground between advocates for the expansion of slavery and people who fought to avoid its spread. These sectional and political differences ripped the fabric of the union of states and eventually helped with the start of the American Civil War, just thirteen years later. In addition, the Mexican War was a proving ground for a generation of U.S. Army leaders who as junior officers in Mexico learned the trade of war and later applied those lessons to the Civil War. The U.S. Congress declared war on May 13, 1846, while Mexico did so on May 23. Most of the formal fighting effectively ended on October, 1847, soon after the fall of Mexico City. 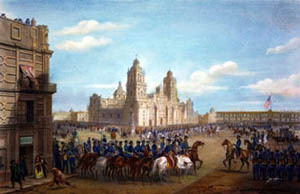 A provisional government had been established at Querétaro, about 100 miles northwest of Mexico City, with a former chief justice of Mexico’s Supreme Court, Manuel de la Peña, as interim president — while some states remained in rebellion against the central government and some, including monarchists, wanted to continue fighting the United States. In November enough support was given to the national government that a quorum was considered to have been obtained and legitimacy established, allowing Peña’s government to move toward a settlement with the United States. Negotiations began in January, and The Treaty of Guadalupe Hidalgo was signed on February 2, 1848. Those who had wanted the United States to acquire Baja California, Sonora, Chihuahua, Coahuila and other northern states, and Yucatán, were disappointed. But from Mexico the United States won recognition as having Alto California, New Mexico and Texas to the Rio Grande. Mexico was given a guarantee of rights for the people who had been living in these areas and loyal to Mexico. The U.S. agreed to prevent attacks by Indians across the new border into Mexico. Mexico was agreeing to giving up a good percentage of its territory, and although the United States was virtually dictating the terms of the settlement it wanted to give Mexico something and agreed to pay 15 million dollars for damages, to assume responsibility for 3 million dollars in claims against Mexico by U.S. citizens and to relieve Mexico of its monetary debt to the United States. The U.S. President received the signed treaty on February 19. Mexico’s Congress went into session in May and ratified the treaty. And that month so did the U.S. Congress — a treaty that was to remain active into the twenty-first century. In the war, the United States lost 1,721 killed and 11,550 deaths from other causes, mainly disease, and the war cost the federal government $100,000,000 in 1848 dollars.